If you weren’t satisfied with the dozen or so messaging apps available, there’s an old contender returning from the dead — Yahoo Messenger. Yahoo pulled its messaging app in the spring, but the company just relaunched it with a focus on group messaging and sharing. The new app integrates with Flickr, Tumblr, and Xobni platforms, allowing users to pull and share GIFs and images instantly. Utilizing acquisitions like Flickr and Tumblr, Yahoo Messenger’s feature highlight is its ability to send “hundreds of photos” at a time that simultaneously appear for everyone in a group conversation. Working off the cloud, the app also lets users download the photo in full quality. Another highlight is its “unsend” feature, which acts more like “I never said this.” When you delete a message in most messaging apps, it goes away for you, but others who have received the message can still see it. “Unsend” lets users delete a message, photo, or GIF, making it disappear for everyone in the conversation. 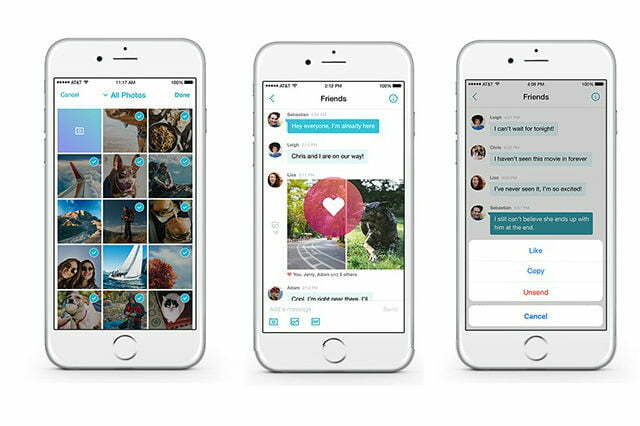 Similarly to GroupMe, the app also lets users “like” other messages, and any group member can add other participants, change the name of the group, and change the group photo. GIFs are all the rage, so apps like Facebook Messenger have added the ability for users to search for GIFs, and Yahoo is following suit. “Now you can search and find the perfect GIF in the new Yahoo Messenger app. Get instant access to a virtually unlimited and ever-growing library of GIFs pulled from the Tumblr community, where tomorrow’s most popular GIFs are born each day,” Jeff Bonforte, senior vice president of Product and Engineering for Communication Products, said in the blog post announcement. Yahoo Messenger also uses Xobni, a service that offered search- and people-based navigation on Microsoft Outlook, to power its Smart Contacts. In the announcement, Bonforte says Smart Contacts understands the relationship between a user’s contacts, making adding people to a group faster. He also is touting the app’s speed, saying that conversations sync across all devices almost in real-time. Yahoo is hoping its new app will be a hit. The company’s previous attempt earlier this year, Livetext, a mobile video messaging app it built after acquiring MessageMe in 2014, has not picked up any traction. You can grab Yahoo Messenger on iOS, Android, and the Web, but it’s also available in Yahoo Mail on the desktop.